1907. 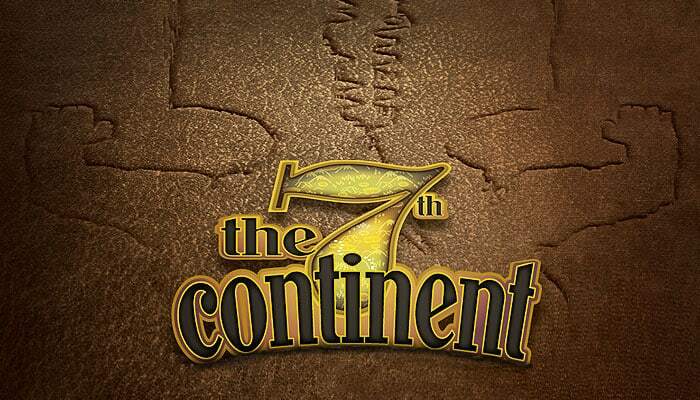 A renowned explorer, you have just come back from the first expedition on the seventh continent, a mysterious land that was recently discovered off the coast of Antarctica and probably the very last terra incognita in the world. Coincidentally, you have been lethargic for a few days, feeling feverish and finding it difficult to get up from bed. A cold shiver runs up and down your spine. You have to face the facts: an evil is consuming you from within. At nightfall, you fall into a restless sleep without knowing that, for you, this is only the beginning. 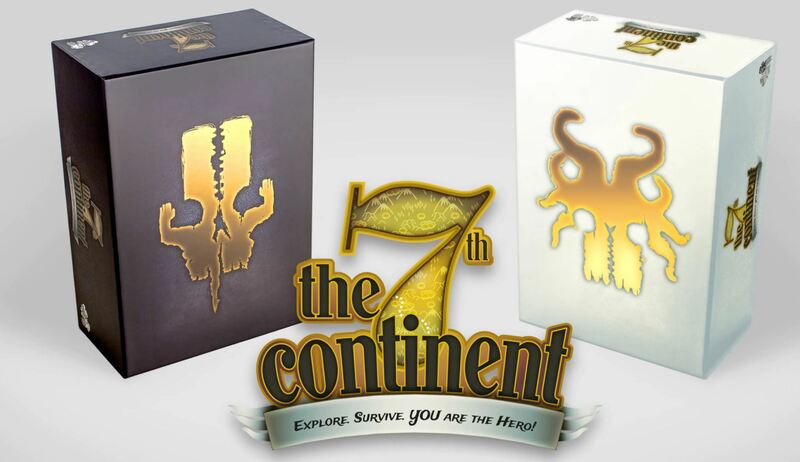 The 7th Continent is a cooperative adventure, exploration and survival board game, in which you play against the game and try to lift the curses that have been placed on you. You may take up the challenge on your own or in a team of 2, 3 or 4 explorers. 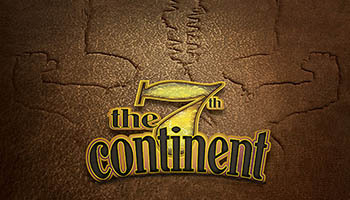 Once you have selected your character, you will explore the seventh continent by resolving Exploration cards and putting numbered Adventure cards (Terrains and Permanent events) into play, which will gradually form the Board. During the game, players decide collectively and freely which character will perform an action among those that can be seen on the Terrain card their figure is standing on, the Permanent event cards attached to that Terrain card, and the cards he/she has in hand and in his/her inventory. To take these actions, you will use an Action Deck that represents the collective life force of your characters. 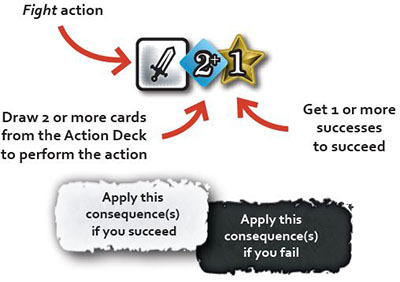 All actions work the same way: you must pay their X-cost by drawing a minimum required number of cards from the Action Deck, and obtain a minimum required number of Y-successes (depending on the action's difficulty) to perform them successfully. These successes appear in variable amounts on the cards you have just drawn. Then, you will apply the consequence of the action, which depends on the success or failure of the action. Failing at performing an action may have nasty consequences, such as causing you to take negative State cards, which may force you to discard cards from the Action Deck, thereby reducing your life force. Want to stack all the odds in your favor? You may choose to draw more cards from the Action Deck to get more successes. However, every card in the Action Deck is a bit of your life force and when the Action Deck is exhausted, so are you - then, every action might well be your last. Thankfully, the Skill and Bonus cards you have in hand, the Item cards in your inventory and the help from your companions in misery will make things easier for you, particularly by decreasing the cost of your actions or by increasing your chances of success. 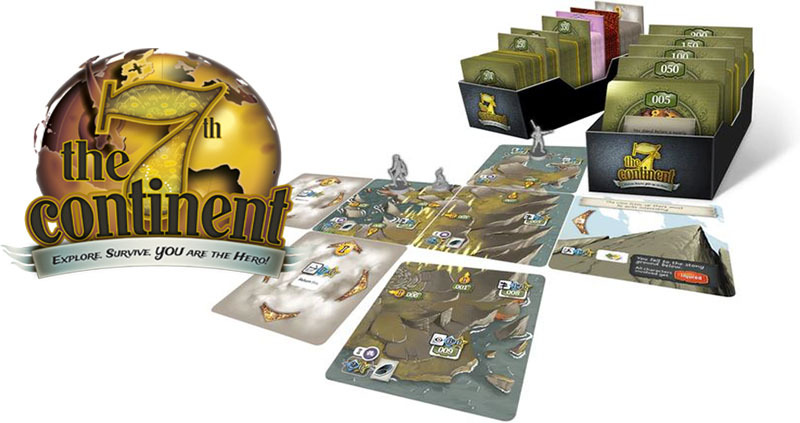 Unlike most board games, The 7th Continent will make you experience one extended, non-stop adventure. It will take several hours of exploration and adventure to lift each curse... or die trying. This is where the easy saving system comes in so handy: you can stop playing at any time and resume your adventure later on. We recommend that your sessions run between one and two hours, since some events - game/prey returning to be hunted, for example - cannot happen unless you save the game (as if you had camped for the night). Green or gold numbered cards include the terrains you will discover as you explore the continent, the predefined events (places, encounters, etc) you can trigger, items you can find, as well as many more surprises to be discovered! Terrain cards are portions of the continent that remain in play on the Board. Action Deck: contains the blue Action cards that players draw to perform actions. Active player: the player whose turn it is (the one who takes an action). Advanced Skill cards: new skill cards that players can purchase at certain moments in the adventure (the game will let you know when you can) by spending the experience points they have earned. Adventure Deck: contains the green and gold numbered Adventure cards.